If I had a penny every time someone searched for Latest Bride Sister Lehenga Designs, I wouldn’t have to work another day. While bridal outfits especially lehengas are all over the place. You have so many stores, designers etc giving zillions of options to choose from. For a sister of the bride though, things are not so black and white. The difference of pre-wedding lehengas vs sister of the bride lehengas is still somewhat in the grey area. But the good part is, as a brides sister, you can pretty much get away with anything. Whether you choose to wear bridal colours like red, orange or offbeat colours like white and black, society is pretty lenient towards the sister of the bride’s outfit choices. Anju Modi this time around in her ICW 2018 collection showcased some beautiful Indian wear pieces. They were not typically bridal per say, somewhere in between. Thus making them the perfect fit for Latest Bride Sister Lehenga Designs. Whether you are the bride or the sister of the bride, these gorgeous yellow mustard lehengas are great for one of the Pre-Wedding functions. 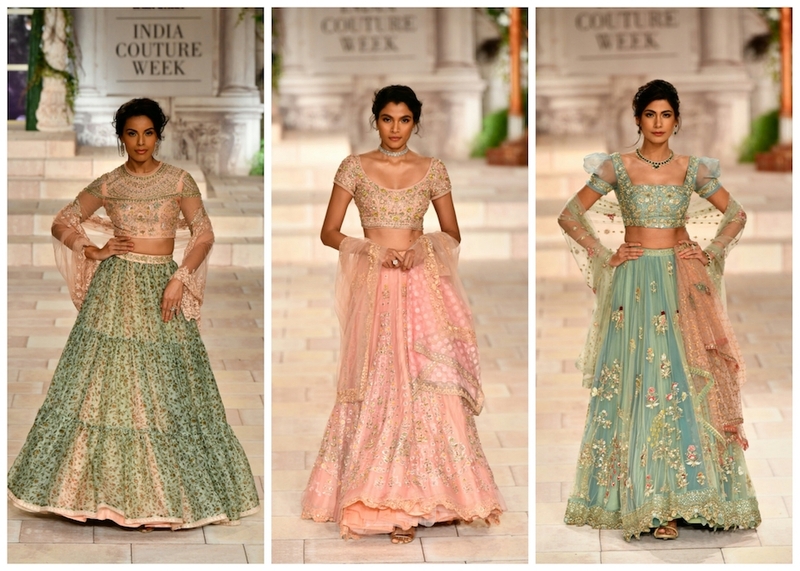 I love how one lehenga skirt has been styled with various blouses from peplum to crop tops giving options to brides. You can easily reuse the printed full flared skirt post wedding for your bestie’s wedding. Oh, I just love the sleeves of this third mint lehenga. Looks like she has got tin wings up her sleeves. Pretty cool isn’t it? As a bride, you can still choose to wear these by adding lots of cancan under your skirt. But for a brides sister, I think these look phenomenal as is. The light pastel shades with delicate embroidery work are all very cutesy yet making the right statement. Ok, I understand it might not be feasible for everyone to buy an Anju Modi design for their brother or sisters wedding. But this lehenga design, in particular, is easy to recreate on your own as well. Wear a brocade lehenga skirt with a heavy embroidered blouse bought from any blouse store. Then all you need is a slightly heavy solid maroon colour dupatta to go with it. For sure, the end product will not look like this. But you can get a DIY lehenga for a whole lot less. Velvet is back in trend. Winters is the next big season for weddings, and that makes for the perfect time to wear this heavy fabric. The good part about choosing velvet is that you don’t need to add additional embroidery and lacework to make it look richer. The fabric takes care of all that on its own. Team it up with something sheer with delicate embroidery work instead of going all out cray-cray. Kangana has that Victorian feel and attitude that is needed for my show. She became the choice for my show after I saw her looks in Rangoon. It was spellbinding and Kangana is surely going to storm the ramp. Men these days are inclined towards fashion as much as women are. Everyone wants to look good on their wedding day. Anju Modi showcased some amazing menswear grooms wear collection at ICW 2018. My favourites are the heavy work sherwani kurtas in deep colours. If you are having an evening/night wedding, these will look amazing under yellow lights. But if you are having a morning nuptial, go for the off-white cream toned sherwanis. This barely their sleeves has totally caught my eye. I know there are a few brides who don’t mind risky outfits for their wedding day. But for every risky bride out there, I know ten others who’d rather go simple sober on their wedding day. These negligible sleeves in net embroidered kind of fit the purpose of peek-a-boo. You get to look stylish as well as keep the modest look in place. The thing about Anju Modi is that you will always find variety in her collections. Her previous collections will have no similarity to her newer ones. If you are new to Anju Modi designs, check out these posts on her previous collections. She is the same designer behind Bajirao Mastani looks. While the ICW 2018 Anju Modi lehenga prices are not yet revealed, you can still see what her previous collection bridal pieces cost. It will give a good idea of what should be your budget in case you are an Anju Modi fan.